Our self-storage facilities have extensive opening hours and you have free access to your secure storage unit as often as you would like within our extensive opening hours at no extra charge. 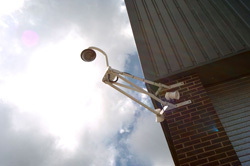 Each site has remotely monitored CCTV outside of opening hours and there are always members of staff on site during our opening hours. There are smoke detectors for the fire alarm system located throughout the building which are tested and serviced on a regular basis. We offer all customers an insurance policy to protect your belongings while they are in storage with us. Please contact your local site for the cost of this policy. All customers are asked to provide their own padlock to put on their self-storage unit so that you control all access to your belongings. If you do not have a padlock we do sell them in our reception area, and they start at £10.00. We also sell a full range of removal boxes and packaging materials over the counter. We require all new customers to bring two forms of identity when they hire a self-storage unit. You will need to provide one from the Group A list below, which verifies who you are, and one from the Group B list below, showing where you reside (or have recently resided). The same document cannot be used to prove both identity and address.